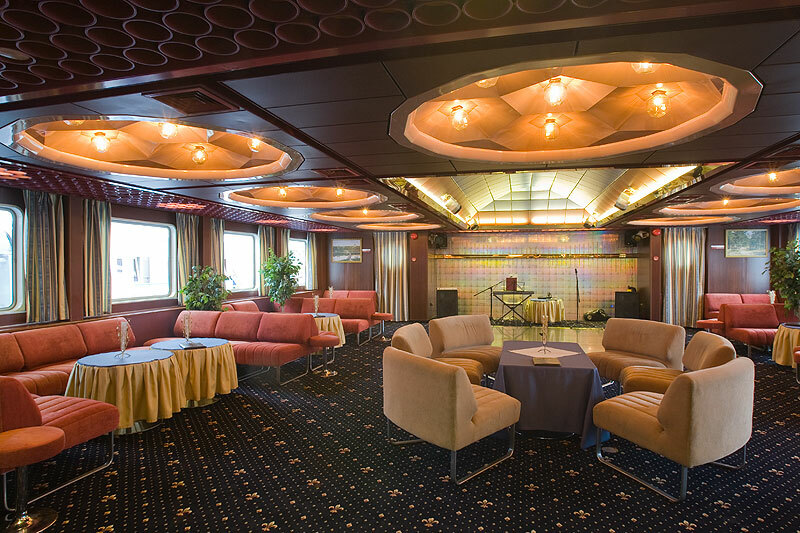 This comfortable cruise ship (Project Q-065) was built in Austria. Maximum capacity – 136 passengers + 74 crew and staff members. 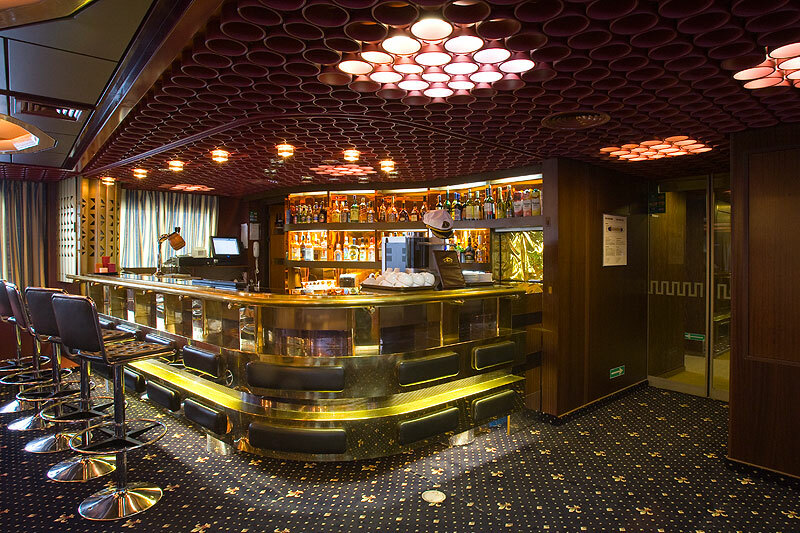 The ship features a restaurant with 112 seats, a bar with 80 seats, a reading room, a sauna. 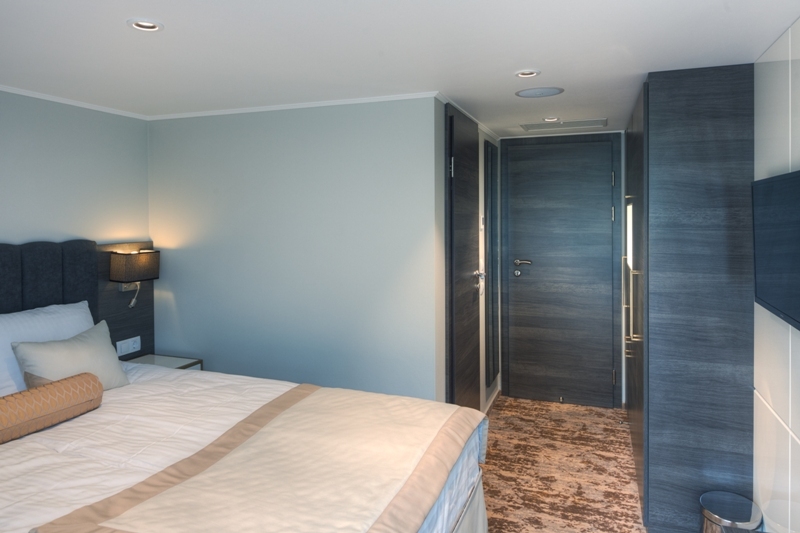 All cabins have panoramic windows and include private bathrooms, air conditioners, 220v sockets, fitted wardrobes, mini-safes, TV with satellite channels. 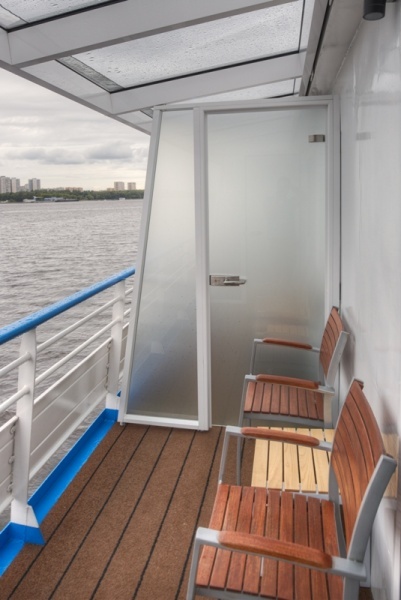 Sauna is located in the bow part of the main deck of the ship, can seat up to 6 people. 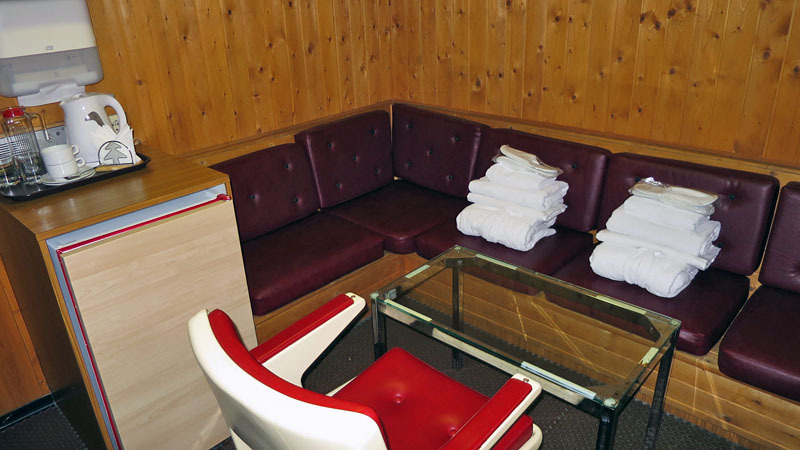 It has a rest room, a steam room, TV, couch, table and tea making facilities. 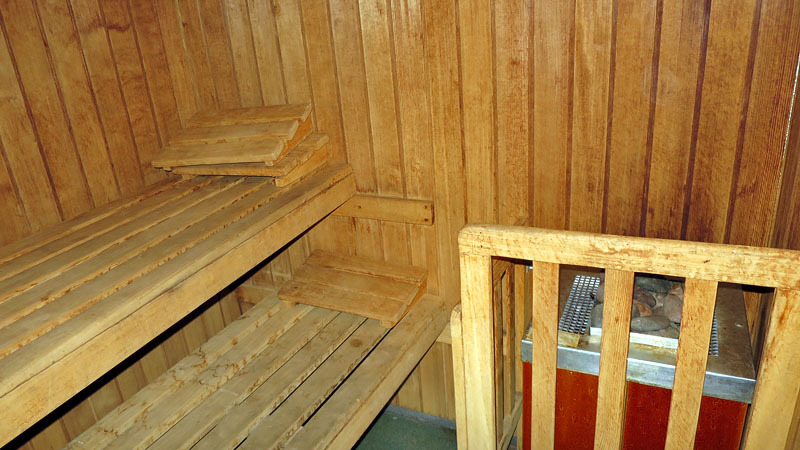 Please note the steam room is suitable for up to 4 people. Departure at 2:30 p.m. (lunch) from the North River Terminal. 1) Kremlin walking tour with a visit to the Spaso-Preobrazhensky (Transfiguration of the Saviour) Cathedral. Tour length - 2 hours. 2) Museum of arts and crafts tour. The museum houses a variety of workshops: wood painting, gingerbread baking, craft felting and beading. Tourists can watch the craftsmen at work and purchase their creations. Master classes are available after the tour. Visit to Alekseyevsky (Alexey) monastery. Tour length – 2 hours. Group size: 15+. 4) Tour to the Vintage Scooter Bike Museum. Find out about the evolution of the bicycle. The museum displays the 19-20th century bicycles, sports bicycles and leisure bicycles, bikes for adults and kids, etc. Ride any of the museum exhibits! Visit to the Alexeevsky Monastery. Tour length 2 hours. (Group Size: 20+). Visit to museum “History of Russian Vodka”. You will hear the story of Peter Smirnoff, view different types of alcohol stills and see a display of antique bottles. Tour length - 40 minutes. Stop at the Folk Toy Museum. Discover the unique, almost 50 years-old collection. Find out about the cultures and traditions of more than 35 countries through games and toys. Tourists will get to know more about the daily life, customs, and rites of Russians. Tour length: 45 minutes. 1)Bus tour to Kirillo-Belozersky Monastery. 2)Interactive program Journey to Rus Iznachalnaya (Primary Rus). A medieval northern village of the 11th to 13th centuries has been recreated on the picturesque banks of the Sheksna river. You will be told about ancient Russian costume, jewelry, arms and armor, dinner ceremonies, and rituals. Master Classes: Pottery (Group Size: 10-30 people), Smithery (Group Size: 5-15 people), Russian Table Songs (Group Size: 10-30 people), Weaving (Group Size: 5-10 people). Master Classes range from 1-2 hours in length. Tour length - 3 hours. (Alternative to the main excursion). Bus tour to Ferapontov Monastery. You will see the refectory, the parvis, frescoes of The Virgin Nativity Cathedral and the monastery site. Tour length - 3 hours. (Alternative to the main excursion). Your choice: 1) City walking tour with a stop at the “Submarine Б-440”. First-hand experience on a large ocean diesel submarine, equipped with its original machinery, systems and weapons, allows visitors to see the internal structure of the boat, understand the life of submariners, examine military memorabilia, climb up to the conning tower and check out the main deck of the ship. 3) City walking tour with a visit to Vytegorsk local history museum. Theme tour "Vytegorsk Hunting." The exhibition tells you about traditional fishing instruments, methods for catching animals, and hunting traditions and signs. Don’t miss the unique taxidermy sculptures of birds and animals from the collection of the museum's founders. 4) City walking tour with a visit to museum “Waterways of the North”. This retro exhibition, housed in the building of a hydroelectric power plant, introduces visitors to the history of the construction and operation of the Mariinsky water system and the Volga-Baltic Waterway. You will find the most interesting documents, photos, and layouts of the gateways on display. 1) Bus tour to the Holy Troitsky (Trinity) Alexander Svirsky Monastery. Tour length – 3.5 hours. 2): Bus tour to Vvedeno-Oyat Women’s Convent (Group size: 35+). 3) Bus tour to Olonets. Visit to the National Museum of Ethnic Karelians-Livviks. The museum serves as an introduction to the development of the first Karelian city – Olonets, its role in the history of Russia, traditional culture of Karelians-Livviks and their crafts, trades and family rituals. Tour length – 4 hours. (Group size: 35+). The Past and Present of Veliky Novorod Bus Tour. You will see the Merchant and Sofiyskaya parts of the city, the Alexander Nevsky Bridge, Yaroslav-the-Wise Novgorod State University, the place where the first Birchbark Manuscript was discovered, Church of Transfiguration of our Saviour on Ilyina street, Znamensky Cathedral of the 17th century, Church of the Saint Great Martyr Fedor Stratilat on the Brook (1360-1361). Next stop – Yaroslav’s Court with its ancient White Arcade – architectural monuments of the 12-17th centuries. According to legend, Prince Yaroslav build here at the beginning of the 11th century a magnificent palace superior to all of its counterparts in Europe. Check the walls and towers of the old Kremlin,St. Sophia Cathedral of the 11th century, Monument of the Millenium of Russia – a bronze embodiment of the history of the Russian State, the ancient bells of Veliky Novgorod of the 16-18th centuries. Down the roads of Medieval Ladoga Walking Tour includes the fortress and a display at the Gate Tower. Find out about the Ladoga at the times of Ryurik, and Oleg’s Fortress, traditions and everyday life, weapons, and warriors of the Medieval epoch. The tour guide will talk about the role of Ladoga in protecting the borders of the Novgorod lands, about the life of the military center at the Time of Troubles and the Great Northern War. Two ancient Ladoga monasteries were the centers of spiritual life. Nikolsky Monastery is located on the Volga Embankment. Tourists are invited to the functioning John Chrysostom Cathedral where they can see the relics of St. Nicholas the Wonderworker. Uspensky Convent. Known as the place of exile of the first wife of Peter I, Evdokiya Lopukhina. Stop at the Elevation of the Life-Creating Cross Cathedral housing the relics of the great martyr Varvara. Tour duration – 3 hours. Tour distance is 2.5 km. Bus Tour to the ancient Tikhvin City. The earliest records about the Tikhvin settlement date back to the 14th century. By order of Ivan the Terrible two monasteries were founded: Dormition of the Mother of God Monastery and the Presentation of the Blessed Virgin Mary Convent. Tour of the Monastery. Stop at the Dormition Cathedral where miraculous icon of the Holy Mother of God is presented. Distance is about 100 km. Travel time is 1 hour and 40 minutes (one way). Tour length – 5,5-6 hours. Ship tour to the central estate of the Spaso-Preobrazhensky (Transfiguration of the Saviour) Cathedral. 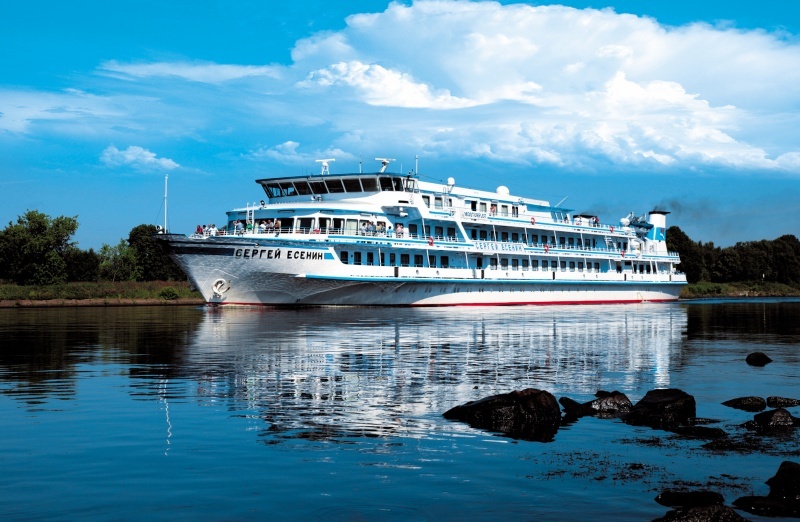 The ship tour goes through the most beautiful places of the Valaam archipelago among small islands, straits and the impressively secluded Predtechensky (Baptist) and Nikolsky skits (hermitages). During the tour of the Central Manor, you will visit the main operating cathedral of the monastery – the majestic Spaso-Preobrazhensky (Transfiguration of the Saviour) Cathedral. Tour length - 3.5-4.0 hours. 1) Walking tour “Valaam’s Skits”. You will visit three of Valaam’s skits (hermitages): the Voskresensky (Resurrection), the Gethsemane and the Konevsky. Enjoy the unique natural phenomena of the Valaam archipelago - its flora and fauna. Route distance is 6 km. Tour length - 3.5 hours. (Group size: 15+). 2) Walking tour “Rocky Shore”. The tour introduces visitors to the history of the Valaam Monastery during the Soviet-Finnish and Second World Wars. Savor Valaam’s unique nature surrounded by the Ladoga, the largest lake in Europe. Route distance 6 km. Tour length – 2.5 hours. (Group size: 15+). Walking tour of the village. As part of the tour, guests will visit the arts and crafts village. 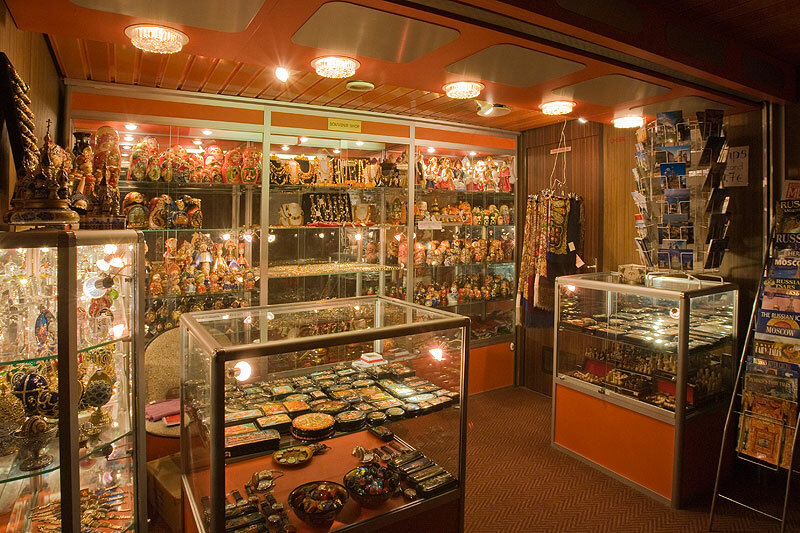 Check out the workshops of potters, blacksmiths, and weavers (owners of an ancient loom), and shop for leather goods and Rostov enamel jewelry. Visitors are welcome in the "Old Village", which consists of five hundred-year-old houses, relocated from the Arkhangelsk and Vologda regions. SPORTING, otherwise known as Clay Pigeon Shooting, is the art of shooting special flying targets imitating birds. Guests are transferred in wagons and sleighs to the shooting range equipped with automatic devices flinging saucer-shaped targets into the air. The shooting range is located in a beautiful pine forest. The shooting is done under supervision from instructor. Enjoy a quick tea break with pirozhki. The programme length is 1.5 hours. Arrival at 8:00 p.m. (dinner) at the North River Terminal. You can also order individual excursions for an extra fee. Please contact your cruise director or administrator on board. 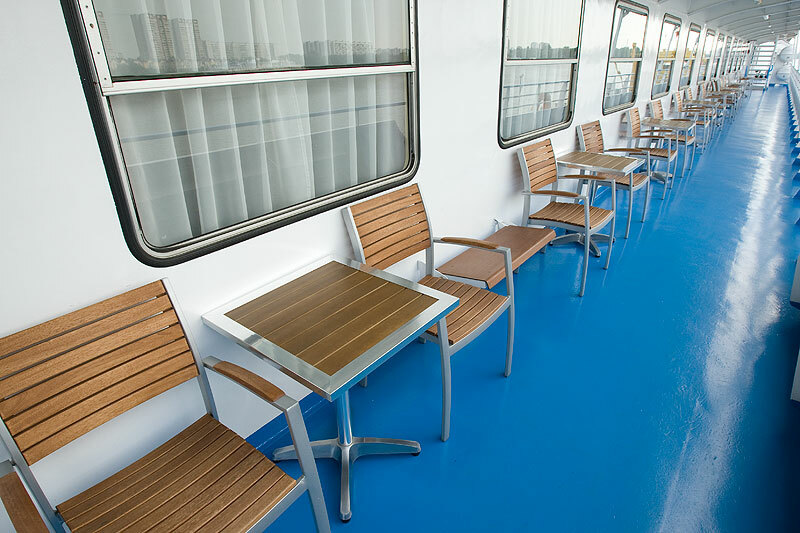 We charge 3,000 Rubles per day for accommodating children without a berthing space (5 and under). 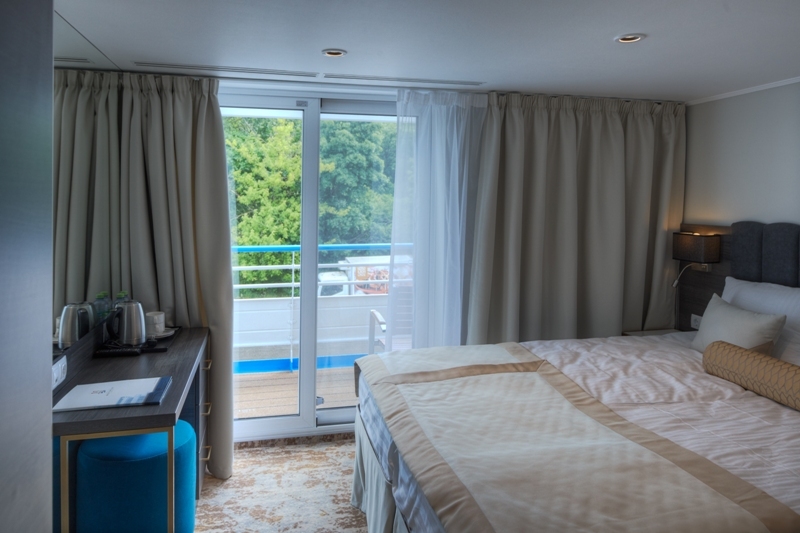 2-room cabin located on the boat deck. 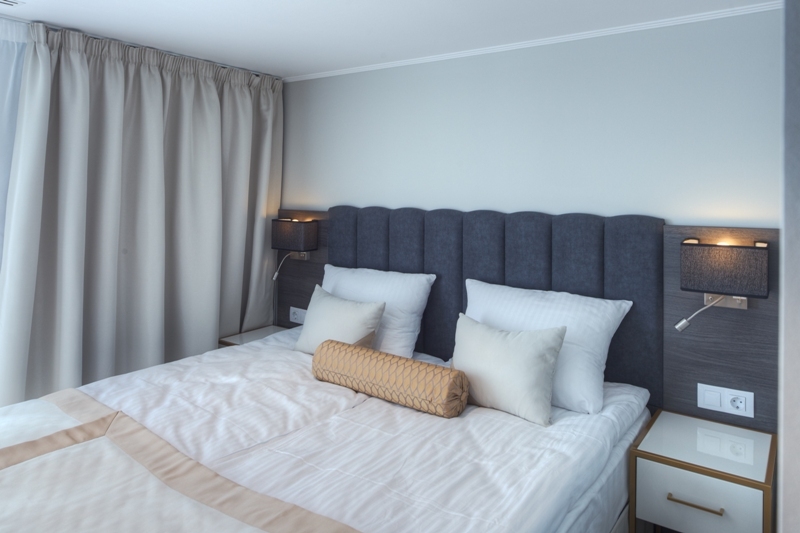 The cabin consists of a restroom (washbasin, shower and toilet), double bed, upholstered furniture, TV, fridge, air conditioner, mini safe and a balcony. 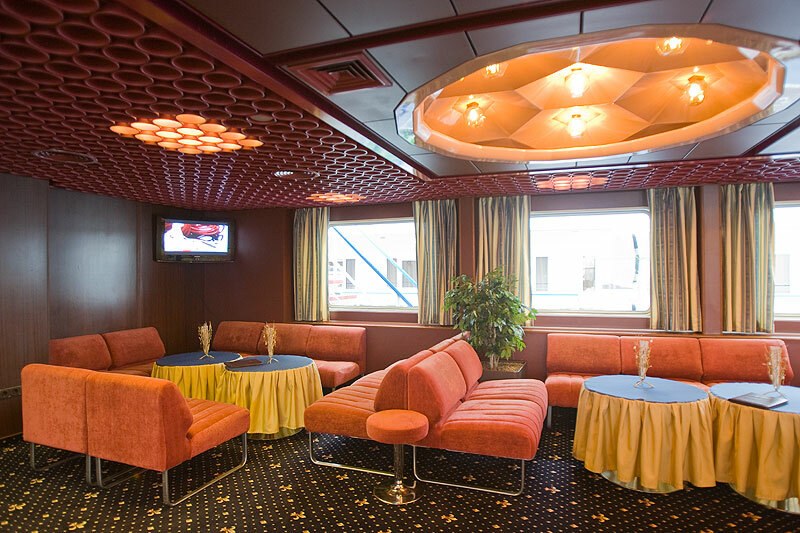 2-room cabin located on the middle deck. The cabin consists of a restroom (washbasin, shower and toilet), double bed, upholstered furniture, TV, fridge, air conditioner, mini safe. 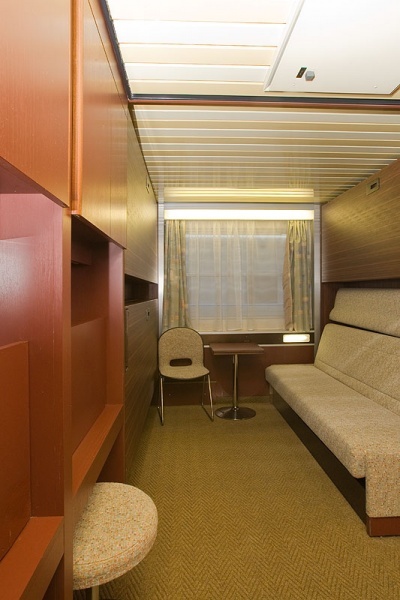 Double cabin with extra space located on the middle deck. 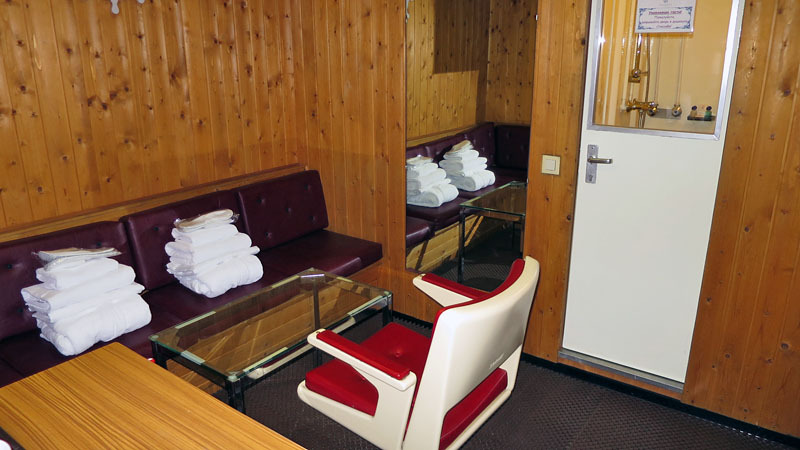 The cabin consists of a restroom (washbasin, shower and toilet), 2 single beds, TV, air conditioner, fridge, mini safe. Double one-story cabin located on the middle deck. The cabin consists of a toilet, shower, air conditioner, TV, mini safe. Double one-story cabin located on the main deck. The cabin consists of a toilet, shower, air conditioner, TV, mini safe. Double one-story cabin (with 1-2 extra bunk shelf beds) located on the main deck. The cabin consists of a toilet, shower, air conditioner, TV, mini safe. Sergey Yesenin (1895-1925). Sergey Yesenin was born in Konstantinovo in Ryazan Governorate of the Russian Empire to a peasant family. 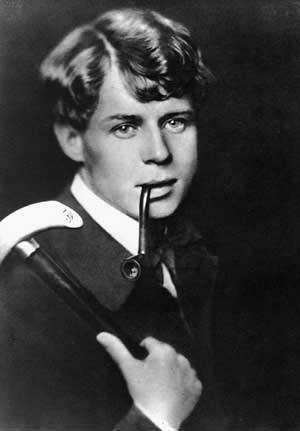 His first poems were published in Moscow literary journals in 1914. Yesenin’s best works poeticise the inner beauty of the Russian people. He is considered one of the best lyrical authors and an innovative poet of Russian nature, extremely sensitive to earth, colors, sounds and smells.